Spacious 3-bedroom apartment in Oslo's barcode. Living/dining room, fully equipped kitchen, 2 bathrooms, large terrace and space for 9 guests. 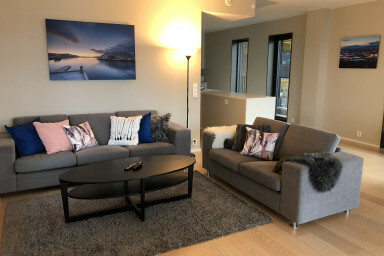 This elegant flat by Sonderland Apartments is located in Oslo's new Barcode area, a row of high-rise buildings close to the Oslo fjord in the city center. The apartment has 3 bedrooms with a total of 2 queen-sized beds and 3 single beds. There is one double bed in the living/dining room area along with with a flat screen TV, a desk and an open kitchen fully equipped so you can make your own meals. A baby crib is available upon request. There are two bathrooms with shower, washer and dryer, free Wi-Fi and a large terrace facing the fjord. The building has an elevator and there is access to the rooftop terrace with amazing views of the Oslo fjord. The Oslo Bus Terminal is an 8 minute walk away and it takes about 7 minutes to walk to the main train station. The tram and bus stops are a few blocks away, as well as cozy cafes, restaurants and the supermarket. The Medieval Park with historical ruins, and the Sørenga Salt Water Pool is only a short walk away. Karl Johans gate, Oslo's main street with restaurants and shopping, is a 10-minute walk away; and the amazing Oslo Opera House is only 5 minutes away.